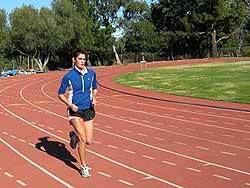 Interval training is a great way to increase running speed. There are several ways you can incorporate this into your weekly trainings. To understand interval workouts, it's important to first understand two words: aerobic and anaerobic. Aerobic means with oxygen. When performing an aerobic exercise, oxygen is supplied to the muscles we are working through our breathing. An aerobic exercise can be carried out for much longer periods of time than an anaerobic exercise because we are simply breathing in enough oxygen to fuel our workout. Anaerobic exercise requires more oxygen than what we can provide just by breathing in and out. This forces the larger muscles to take over. Anaerobic exercise cannot be carried out for very long periods. This concept will become more clear later on. For now, the basic idea is this, varying your cardio workout between higher intensity periods called "repetitions" and lower intensity recovery periods called "intervals" or "rest periods." You will see more results faster than regular cardio (aerobic) workouts. That is because interval training burns fat which stays off, it burns more calories and it helps workout the larger muscles that you wouldn't normally workout with an aerobic workout. Interval workouts are especially beneficial for the runner because not only does it give all the benefits listed above, but it also helps increase running speed and endurance. However, even if you don't care to increase your running speed, you will still benefit from speed work or interval training by being a more fit runner and therefore being able to run at your current speed more comfortably. As you become more fit, you can increase the time and intensity of your reps (medium to high intensity period). You can also increase the time of your intervals (recovery periods) as need be. A variation for the runner would be a run walk. You can start with a 1-3 minute run followed by a 1 minute recovery period, and repeat this throughout your run. I have tried this on and off throughout my running and it has helped improve my running speed and endurance a great deal on long runs because I tire out less quickly so I can run longer. There are several variations of speedwork for the runner. Some variations are timed interval training, the more spontaneous fartlek running and tempo running. All of these are meant to make you a stronger, faster runner with better stamina. Here are some speed training workouts. The The Interval Training Workout: Build Muscle and Burn Fat with Anaerobic Exercise will help you understand interval training. You can find a summary of what this book offers here.